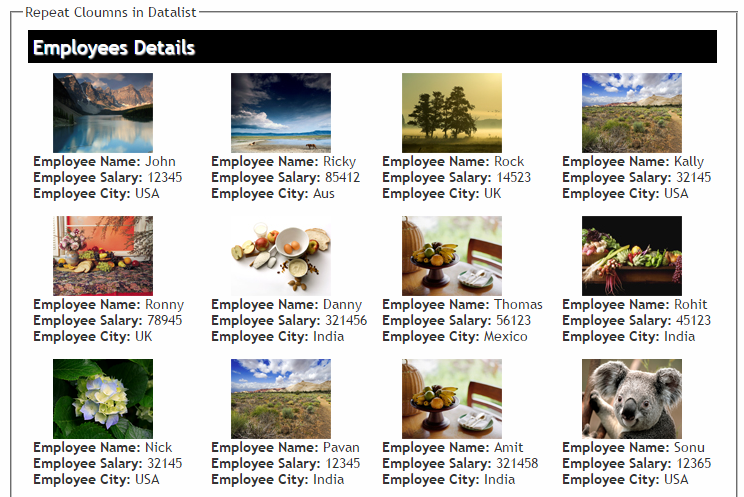 In the previous article I have explained Freeze the Gridview header using Jquery in asp.net, Send email tomultiple users selected in gridview using asp.net (C#, VB) and Take automaticsnapshot (screenshot) and email it using asp.net (C#, VB). We can customize the Datalist layout through its RepeatColumns and RepeatDirection properties. In this example I want to display 4 records in a row with horizontal direction (Left to right). <asp:DataList ID="dlemp" runat="server" CellPadding="5" RepeatColumns="4"
If yes post your comment to appreciate my work and fell free to contact me. You can like me on Facebook, Google+, Linkedin and Twitter via hit on Follow us Button and also can get update follow by Email.